A chart by economist Gerald Friedman estimates the cost of Bernie Sanders’ proposals. As Bernie Sanders absorbs attacks on the political and economic feasibility of some of his major policy proposals, a small but vocal cadre of economic allies is defending the senator’s ideas and projections as accurate and reasonable. The sharpest criticism came Wednesday, Feb. 17, in a letter addressed to Sanders and Gerald Friedman, an economist at the University of Massachusetts at Amherst who has analyzed the impacts of Sanders’ platform. Friedman, an economist schooled at Harvard and Columbia, said he relied on standard economic analysis in his work and on methods used by the nonpartisan Congressional Budget Office. He said colleagues have supported his results and that he wasn’t sure why the backlash has been so harsh. A report from the International Business Times pointed out that two other signers of the letter, Austan Goolsbee and Laura Tyson, have both done work with Wall Street entities, including Morgan Stanley. “Basically what Sanders is proposing is a stimulus, like the Obama stimulus but applied for several years,” Friedman said, noting that one of the critics in the letter, Christina Romer, was an architect of the president’s $800 billion stimulus plan. The disputed reports include a pro bono analysis Friedman did of Sanders’ Medicare-for-all plan back in January. He found that the $1.38 trillion-a-year cost would cover 98 percent of all medical expenses and eventually save the system money, specifically $6 trillion over the next 10 years. A family earning $50,000 a year would save nearly $6,000 annually in health care costs, the analysis claims. Friedman has also released two reports on Sanders’ economic platforms, projecting an idea of what the American economy would look like if Sanders pushed through higher wages, a progressive tax system, infrastructure projects and universal health care. Friedman’s estimates put annual wage growth at 2.5 percent under a Sanders administration. He said poverty would shrink and that recovery from the lingering damage of the 2008 economic crash would accelerate. 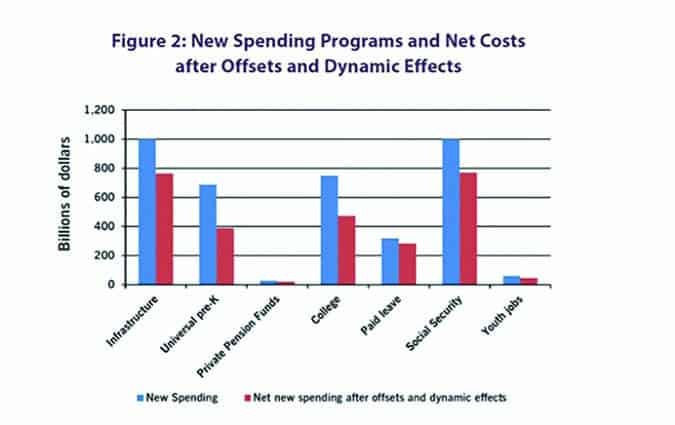 Friedman said Sanders’ major social spending, including on Social Security and free public college tuition, would replace current safety net spending on programs like Pell Grants and food stamps. In a Facebook post Wednesday, economist Robert Reich, a Sanders supporter who was labor secretary under President Bill Clinton, also defended Sanders against the attacks. “Do they really believe that our current system — based on private for-profit insurance companies, whose market power continues to rise as they merge, whose executive pay continues to soar, and whose advertising and marketing and billing expenses continue to go through the roof — is better than a single payer?” Reich wrote. The back-and-forth between economists over universal health care and other boosts in federal spending has grown louder as Sanders has had some electoral success in Iowa and New Hampshire. Economist Kenneth Thorpe, who advised Gov. Peter Shumlin on health care in Vermont, claimed Sanders’ universal health care plan was underfunded by $1 trillion a year, a number then disputed in a Huffington Post editorial by two health policy experts who lecture at Harvard Medical School. And while Fortune magazine has come out against Sanders’ proposal for a phased-in $15-an-hour minimum wage, the New York Times editorial board endorsed the plan Wednesday. A vast amount of brainpower is lined up on both sides of the battle — with Ivy League diplomas and impressive careers — and voters are left to decide whom to believe.